You are here: Home / Elementary / The AMAZING LIST of FREE ADVENT RESOURCES for KIDS! For 2018 the Advent season is in full swing, however, I know lots of homeschool moms (including myself!) are still scouring the internet for homeschool freebies to round out their Advent activities. 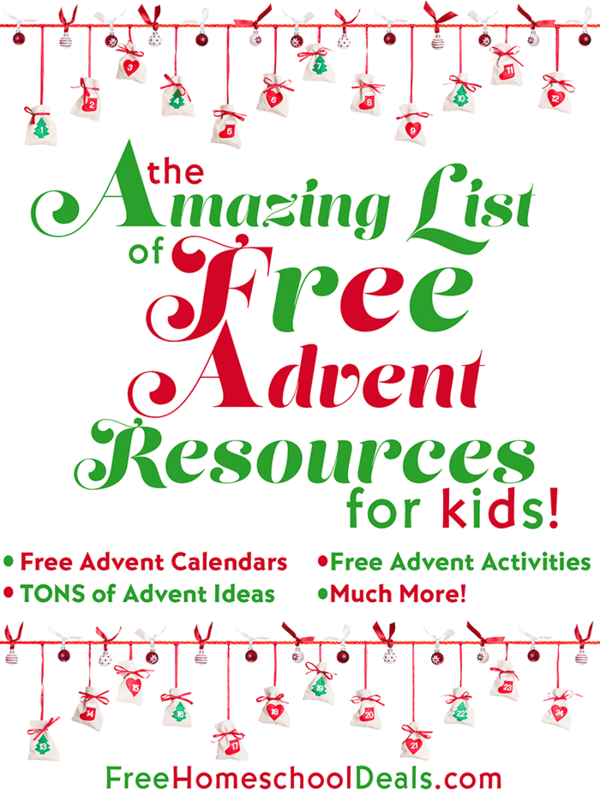 In The AMAZING LIST of FREE ADVENT RESOURCES for KIDS, you’ll find Free Advent Calendars, Free Advent Activities, plus TONS of Advent Ideas and much more! Truth in the Tinsel is a wildly popular Advent experience for little hands. Head over to Truth in the Tinsel to snag a copy for only $9.99! “Spend December impressing God’s Word on your kids’ heart! You’ll get 24 days of Scripture reading, ornament crafts, talking points, and extension activities, plus fun printables and templates! I love these interactive Advent calendars over at Focus on the Family! Red Bird Blue shows you how to create an Advent calendar that tells the whole Christmas story. Keeps things clutter-free with this reusable Advent calendar from Reading My Tea Leaves. Save space with this Advent calendar from The Handmade Home. This Biblical Advent calendar from The Party Teacher tells the full Christmas story, straight from the Bible. Have a birthday party for Jesus with this alphabetical Advent calendar from Blessed Beyond a Doubt. This advent from Raising Lifelong Learners is all about performing random acts of kindness. This Advent calendar made from bags is brilliant! The Creek Line House shows you how to do it!! Make an adorable Advent calendar from treat bags with this tutorial from The Yellow Bliss Road. 25 simple, beautiful Advent calendars from View Along The Way. Create this adorable Christmas tree Advent from Motherhood on a Dime. Use ornaments, baby socks, and photos to make this simple Advent calendar from Martha Stewart. This stocking Advent calendar from Creations by Kara is absolutely adorable! This paper pyramid Advent calendar from Endlessly Inspired is unique and creative! You can use this Advent calendar from Consumer Crafts year after year! Just a few materials are all you need for this no-sew, burlap Advent calendar from Finding Home Farms. All you need is a ladder and a few little buckets to make this vintage-inspired Advent calendar over at Desire Empire. This wedding shower Advent calendar from DIY Network can be filled with little gifts for the happy couple. The Punch a Bunch game on The Price Is Right was the inspiration for this Advent calendar from Studio DIY. Design Sponge has a great tutorial on how to create a gorgeous falling stars Advent calendar. Mini Christmas trees make this Advent calendar from Oh Happy Day extra festive! This Christmas gift Advent calendar from Creation Corner displays each day’s gift in a truly unique way. It’s all about family outings, crafts and giving to others with these Advent activities from KC Edventures. Hip Homeschool Moms has an awesome list of 25 Advent activities for spending time together as a family! You’ll find over 35 ideas for Advent activities and experiences over at Mess For Less. Modern Parents Messy Kids helps you fill your Advent with this list of 24 fun activities. You’ll find tons of interactive Advent activities from Sun Hats and Wellie Boots. A House Full Of Sunshine has an awesome list of 60 activities for your Advent. Have fun with these daily family activities for your Advent from Frugal Family Times. Advent calendar activity cards focus on fun, family, and kindness from Mama Papa Bubba Blog. Bamm Boo has great ideas using jars for your Advent activities. From fun at home to movies, Adriel Booker offers 150+ activities for your Advent! Frugal Living NW has a great list of Advent activities ranging from gingerbread houses to a “Red & Green” themed meal. These family-related Advent activities from Talk Nerdy To Me are all about giving, sharing, learning, and experiencing. How To Homeschool My Child has some unique homeschooling-type activities. Keep Calm Get Organised has a “12 days of Christmas” Advent activity list for the whole family! Trina Holden has some fun and simple Advent activities just for kids. Crafts On Sea has 40+ fun and festive Advent calendar activities for kids. The Purposeful Mom shares her Advent banner that displays scripture and activity suggestions. This is the ultimate Advent activity list from The Mad House. This list of Advent activities from Boxy Colonial is geared specifically for 8-12-year-olds. A Life Surrendered has a great list of Christ-honoring, giving, focused Advent activities. Christianity Cove has 21 Advent activities to keep your children focused on the true meaning of Christmas. Sun Hats And Wellie Boots has 10 Advent activities for young children. I love this list of fun & festive Advent activities from Teach Mama. From salt dough ornaments to a snowman lunch, Modern Parents Messy Kids has an awesome list of Advent activities the whole family with love! You’ll find a plethora of advent calendar ideas over at All Crafts. These chalkboard-style Advent calendar activity cards from The Idealist Mom are so clever! These Advent Boxes from I Can Teach My Child can be filled with little gifts or scriptures. Start your morning with this Advent reading plan from Hello Mornings. This Advent chain from Jamie Ivey promotes fun, connection, and faith. Kick off your Advent with these “25 days of Christmas” ideas from Thrifty Northwest Mom. You’ll find 20 unique Advent calendar ideas and activities over at Lemon Lime Adventures. It’s all about books with these Advent ideas from Oopsey Daisy. Get your little ones excited about Christmas with these Advent ideas for toddlers from Tales of Beauty For Ashes. The Kennedy Adventures has a list of Advent crafts and activities for kids. Try something new and do “24 Random Acts of Christmas Kindness” as your Advent. Love this idea from Coffee Cups and Crayons. Eyes On Heaven has some great ideas to help your kids discover the magic of Advent. From reindeer poop to fizzy bombs, The Connection We Share has some fun ideas to celebrate Advent! Here are 10 ways to celebrate Advent and have a fun, Christ-Centered Christmas from Faith Filled Food For Moms. FHE Lessons has 24 scriptures that teach each something about Christ and celebrate Advent. Frugal Fun 4 Boys has great ideas for Advent using LEGOs. Use Advent as a way to celebrate and give back with these random acts of kindness from The Mad House. These Advent calendar ideas from Made To Be A Momma are perfect for kids and adults alike! House Revivals shows you how to make a traditional woven Advent star. This list of 100 Advent fillers from Hub Pages is full of small and thoughtful gift ideas. A Mom’s Take shares 25 unique ways to fill your Advent calendar! Make Advent part of your decor with this gorgeous candle centerpiece from Songbird Blog. Jennifer Fulwiler helps you ease into Advent with 24 super simple ideas for Advent. Here are 10 simple ways you can celebrate Advent from The Federalist. Tell the story of Christ’s birth with this Advent reading plan from Not Consumed. This Advent Soup from Amen Corner is perfect for a chilly winter day! Blessed Beyond a Doubt has 100’s of Advent coloring pages to use during the Christmas season. Use these printable tags from Simple As That to create your own advent calendar labels. Celebrate the 28 names of Jesus with this free printable from This Reading Mama. Incorporate music into your Advent over at This Reading Mama. Decorate your tree with Advent ornaments from This Reading Mama. Get daily Advent devotions from Faith Gateway. Primal Kitchen creates real-food Advent recipes. These Gingerbread cookies from Ecosalon are the perfect recipe to start your Advent. AW2SL has an awesome list of ideas for what to put inside your Advent calendar. A Christmas snow-globe cake is a fun craft for your Advent. The Nest shows you how! These holiday chocolate packages from Moonstruck Chocolate Co. are the perfect little Advent surprise! This 25 Days of Service Advent from I Heart Naptime remind you of what Christmas is all about. These handmade paper ornaments from Sweet Makes Three are adorable. These mini Christmas cookies from Craftstorming are adorable and small enough to fit into any Advent calendar. Enjoy lots of laughs with these “25 days of Christmas” jokes from Little Bins For Little Hands. This Advent playlist from Frugal Fun For Boys will help get your family in the Christmas spirit. This Advent book basket from Shower of Roses is a great way to get your kids excited about reading. The Art of Simple helps you understand the real meaning of Advent and how to celebrate it. Turn your holidays into something memorable with these Advent blessings in a jar from Thirty Handmade Days. These Advent ornaments from I Am Momma Hear Me Roar will help you learn more about Jesus and celebrate His birth. Check out our other Advent Freebies! Oh my goodness! What an amazing list! This will keep me set for the entire month. Thanks for including our free printable activity slips too!